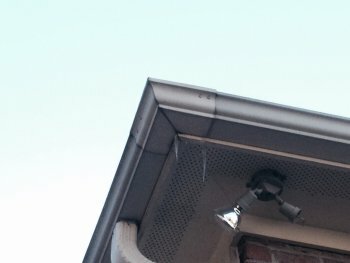 Why are gutter guards crucial? Filed Under: The Smarter Gutter Cover! What condition are my gutters in? Are they loose or coming off? This is typically signs of wood rot. Is there standing water? This is usually due to gutters that are pitched wrong, your foundation that has settled or simply too small of downspouts installed thus providing a great misquote breeding location. Are your gutters nailed in? If so then they will become weak due to water leaking down the nail into the wood causing it to be loose. If your gutters or downspouts have rusting then they are galvanized and will continue to deteriorate. 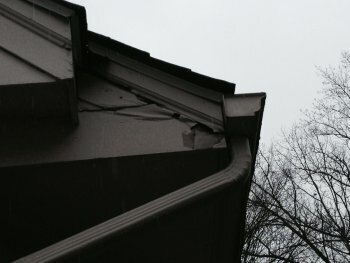 If your gutters have dents they are typically from tree branches or ladders damaging them. Once joints begin to leak they become very challenging to seal permanently due to the existing sealant. If your gutters factory finish have been painted over then they will allow dirt and mildew to build up much faster because it is not a smooth surface. What happens when my gutters clog? Risk someone climbing up ladders, wood rot, foundation damage, ice dams, loose gutters, leaking seams & joints, termites, squirrels, birds, rotten decks, how do we know if the guys are really cleaning out all my downspouts and gutters?, valleys hold debris which cause roof leaks and freezing, pests of all kinds, misquotes, cockroaches and ant colonies. The freezing weather of late has been causing gutters that are clogged to have large build-ups of ice. This then causes the joints to expand and contract breaking seals and causing leaks and icy build-up. Nails expand and contract making gutters weaker. Ice dams also cause wood rot. All these problems are solved forever with LeavesOut Gutter Guards.